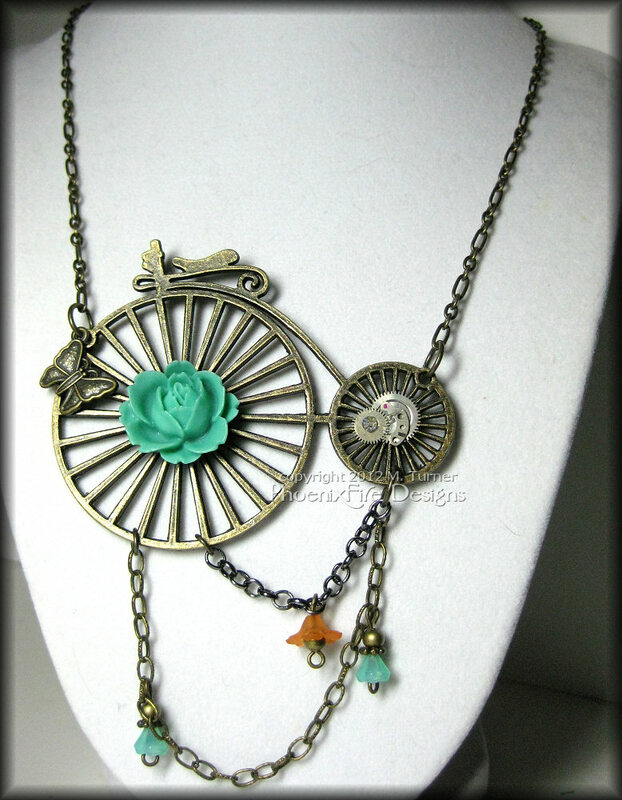 This piece starts with a large, decorative Penny Farthing bicycle pendant in brass (or antique, aged gold color) measuring 3″ at it’s widest and 2.5″ at it’s tallest. I have then embellished it with several accents including a large aqua/turquoise blue rose on the front wheel, genuine watch gears on the smaller back wheel (including a genuine, precious ruby in the clock movement), and a tiny Swarovski crystal in the gears. 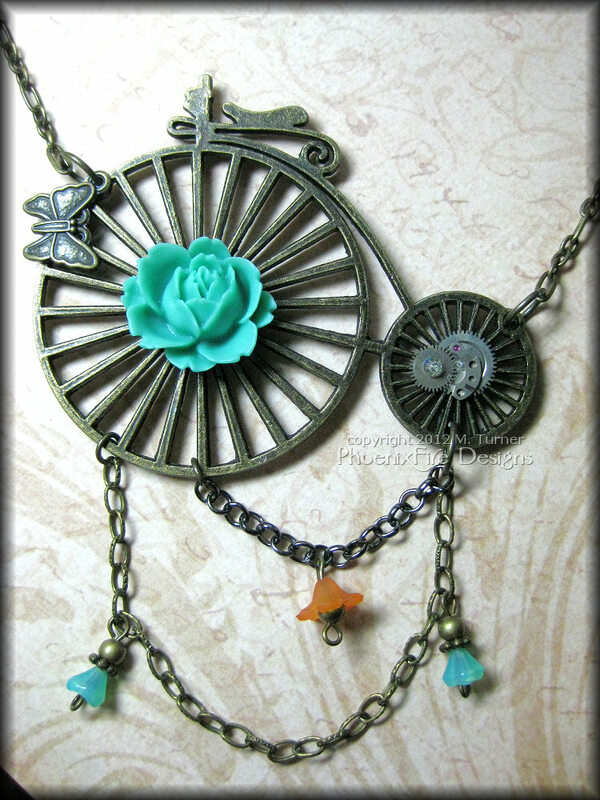 There is also a butterfly charm added to the front wheel and two chains dangling from the bottom. The chains are mixed metals; one is a textured brass chain, the other, a silvery black metallic. Small, matching flowers in aqua/turquoise and orange/peach hang from the chains. It’s fun, whimsical and has a nice Victorian/Vintage style and feel. 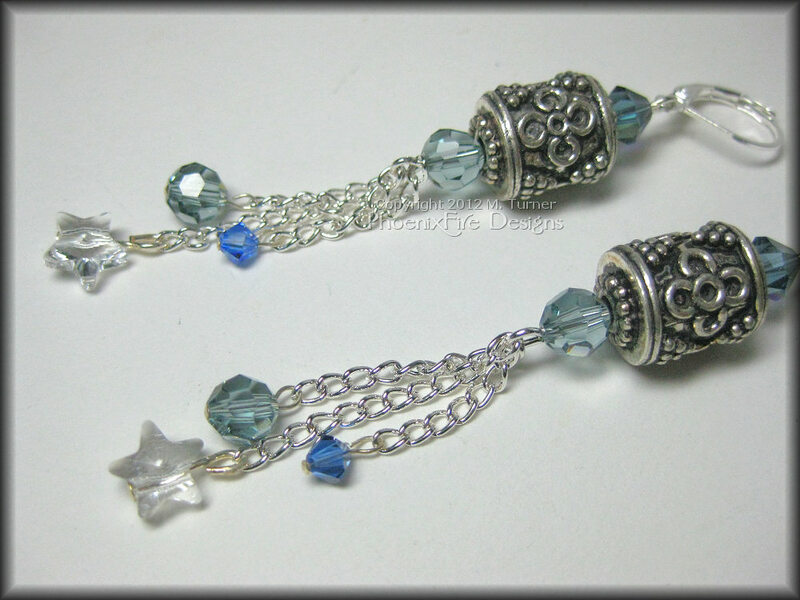 Highly detailed Bali style sterling silver plated beads are accented with several tones of blue and grey Swarovski crystal and crystal stars that dangle from silver chain. I started with sterling silver plated Bali beads with a decorative pattern of flower petal like swirls and grape-like dots. These handcrafted beads are purposefully oxidized to bring out the depth of the pattern. 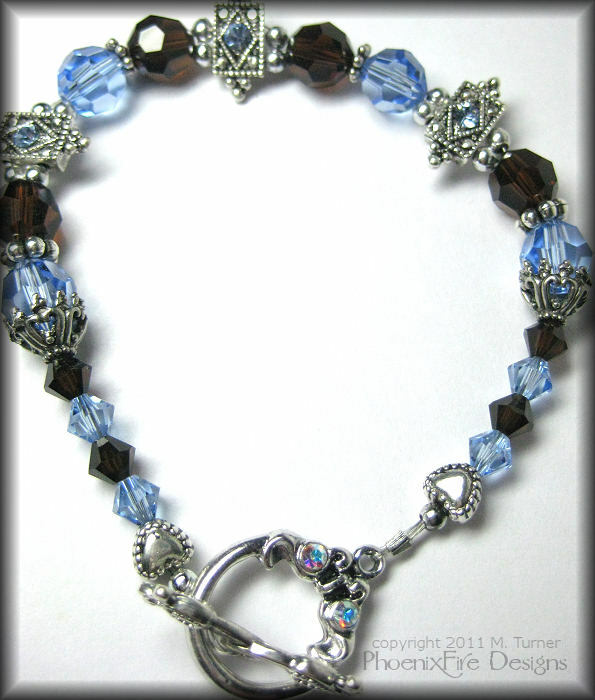 On top is an AB Swarovski crystal in Montana Sapphire; a blue-grey hue. 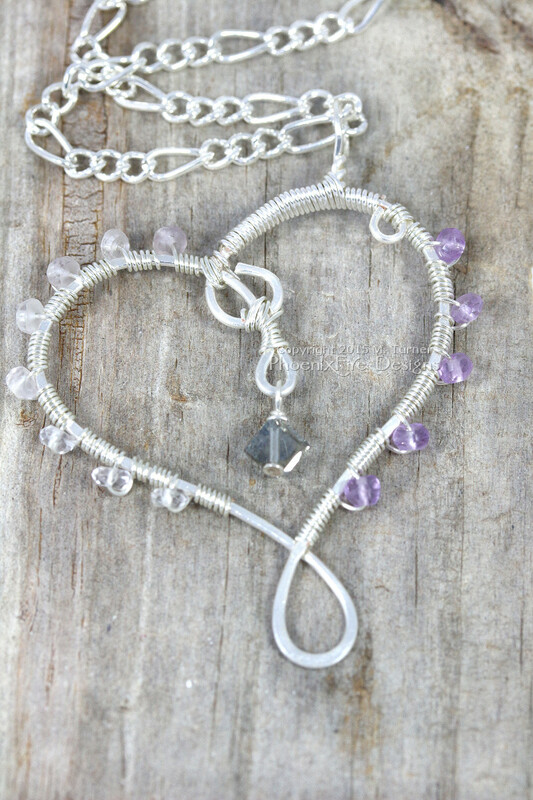 Underneath, is a faceted round crystal, then three lengths of dainty sterling silver plated chain. 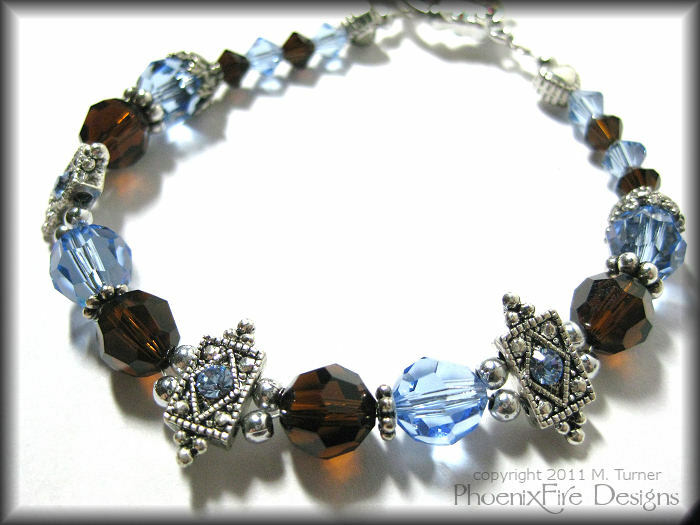 A faceted blue-grey round, a small capri blue bicone and a clear crystal star dangle from each of the three chains. The earrings are finished with sterling plated leverback hooks. The earrings are a total length of approximately 3″ long. They shimmer and sparkle because of the natural movement of the chain and the high refraction of the crystals. The Bali beads give it a look of a prayer bead to me. It has a mystical, Eastern feel and yet is also fun and whimsical. 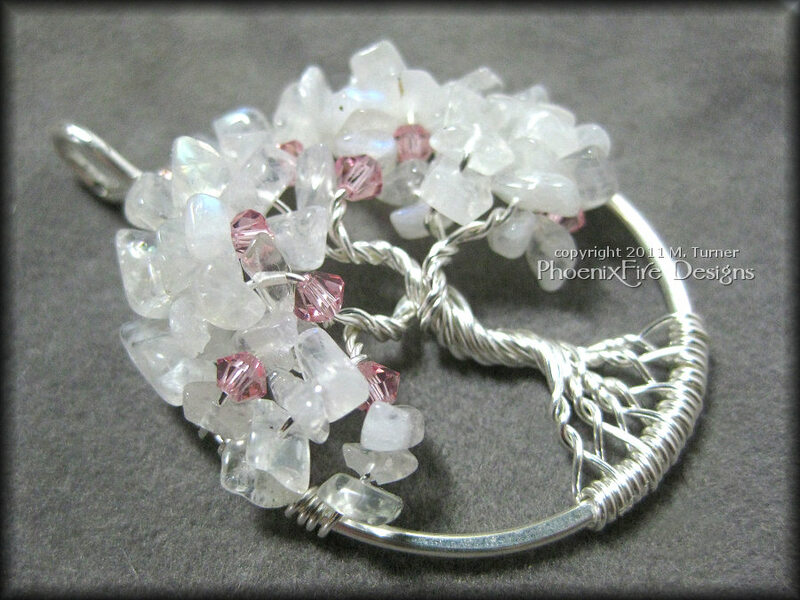 Rainbow moonstone is accented with tiny pink Swarovski crystal bicones in this Cherry Blossom inspired Tree of Life Pendant. Rainbow Moonstone is of course associated with the Moon and with the Goddess Diana. 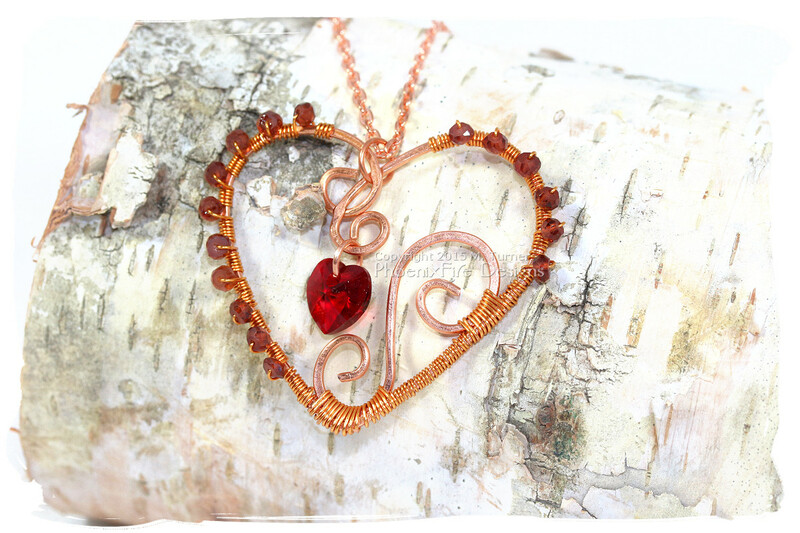 It’s a powerful stone said to protect those of a sensitive nature and bring good emotions to the wearer. The moonstone is said to help one perceive that which “is” and is an excellent choice for meditation or self awareness. Because of it’s tie to emotions and the moon, it’s said to be a woman’s gemstone. Rainbow Moonstone also features a unique inner fire of color and as it catches the light, it shifts through tones of blues and a natural iridescence. Hidden among the moonstone are eight tiny genuine Swarovski crystal bicones in a warm pink. 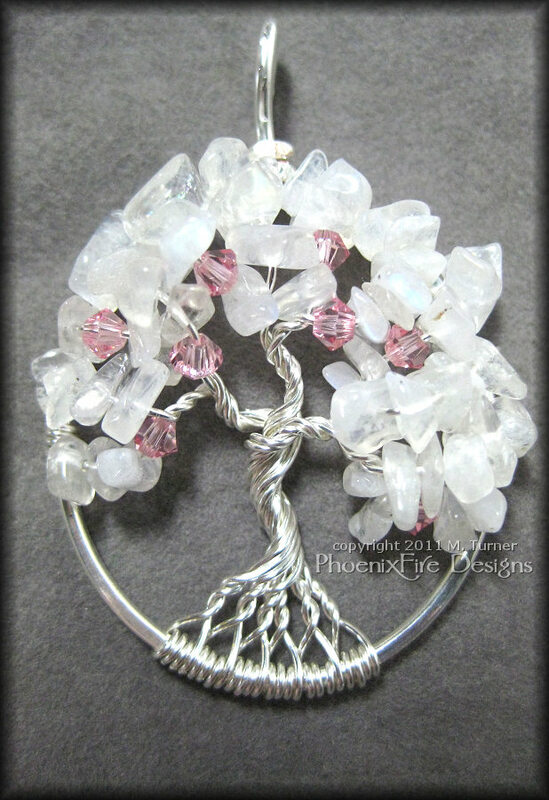 This gives the piece a look of a Cherry Blossom tree in bloom. It was this image that inspired this pendant. The cool, icy feel of the moonstone and the warm, rich pink crystal just plays off each other really well and makes for a great contrast of Spring and Winter. 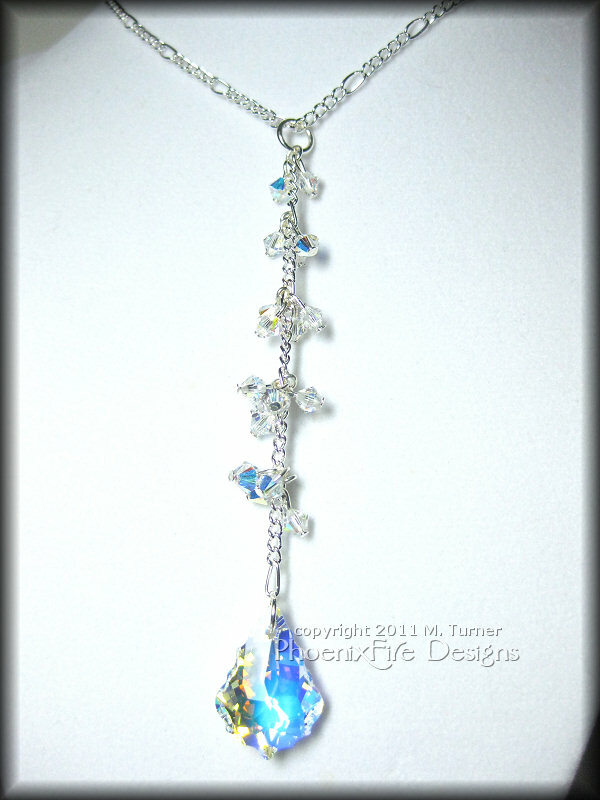 Stunning Swarovski crystal baroque pendant is the focal point of this dangle necklace. Featuring clusters of AB crystal on Figaro sterling silver chain. Swarovski is world-renowned for it’s stunning crystal. Made in Austria, it’s the best crystal in the world. I use it exclusively in this stunning piece. I started this pendant with a 22mmx15mm Baroque Pendant in AB finish. Then I made clusters of AB xillion 4mm bicones for a total of 4″ of dangle. The clusters graduate in size from 5 at the bottom, to four, three and then two. The dangle is then attached to a 16″ Figaro chain plated in sterling silver. 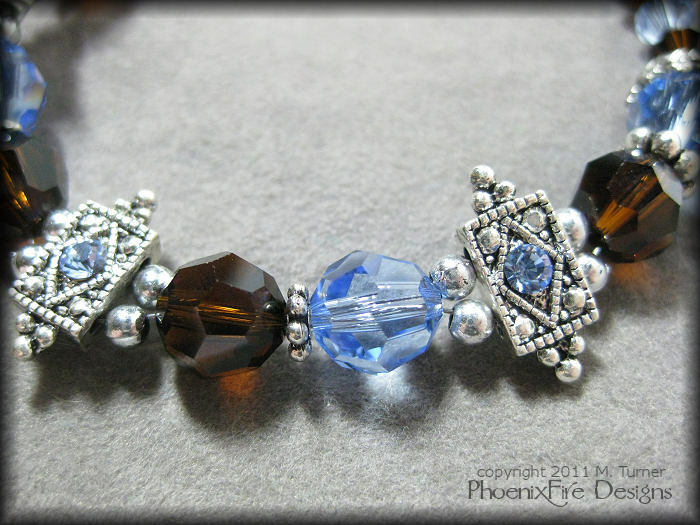 It’s finished with a toggle clasp accented with additional AB Swarovski crystals. 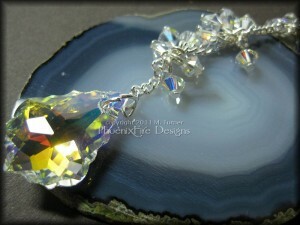 The AB Finish (“Aurora Borealis”) is amazing and gives the crystal an inner fire like no other. As the light hits the crystal you get an explosion of color across the whole rainbow spectrum. Fiery orange, blues, greens, yellows – as the light plays across the crystal, it changes with each motion and just amazing when worn. I made this necklace with a bride’s big moment in mind. Think how amazing the AB Swarovski crystal will look around her neck as she walks down the isle. Every camera flash will make the crystal come to life. 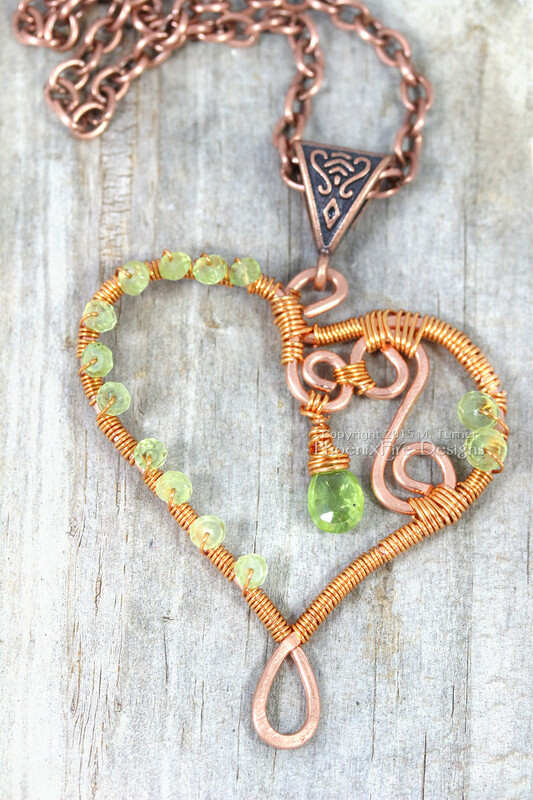 This pendant would also be perfect for a special event or formal occasion where you want to really shine. Though simple in style, the elegance and amazing quality of the crystal make it something special. Something a little different today – a cute little teapot bookmark! 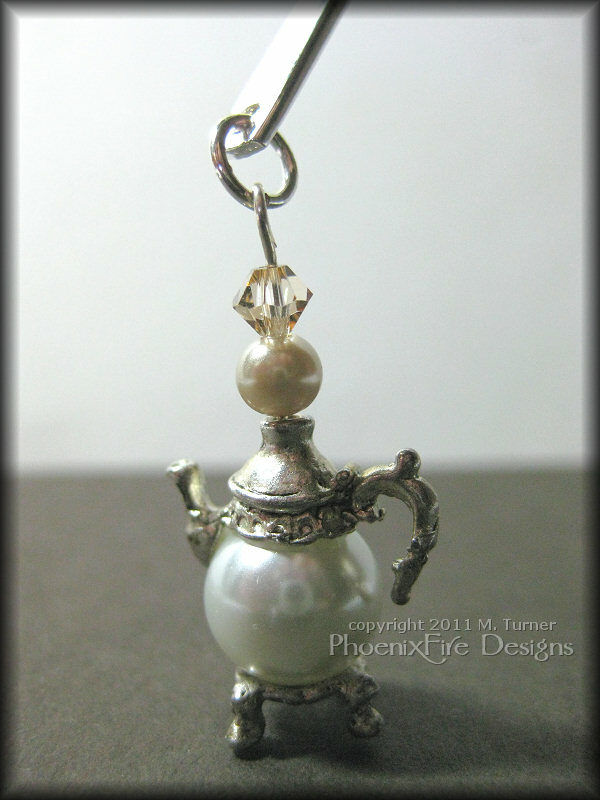 Teapot charm dangles off a metal “Shepherd’s Crook” style bookmark. It’s accented with Swarovski crystal and glass pearls. 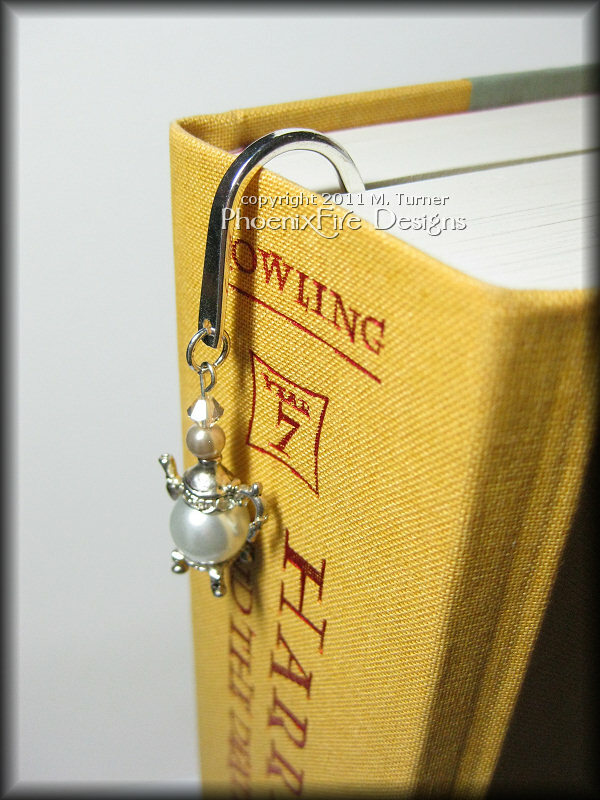 Cuddle up with a good book and a cuppa when you use this cute teapot bookmark! 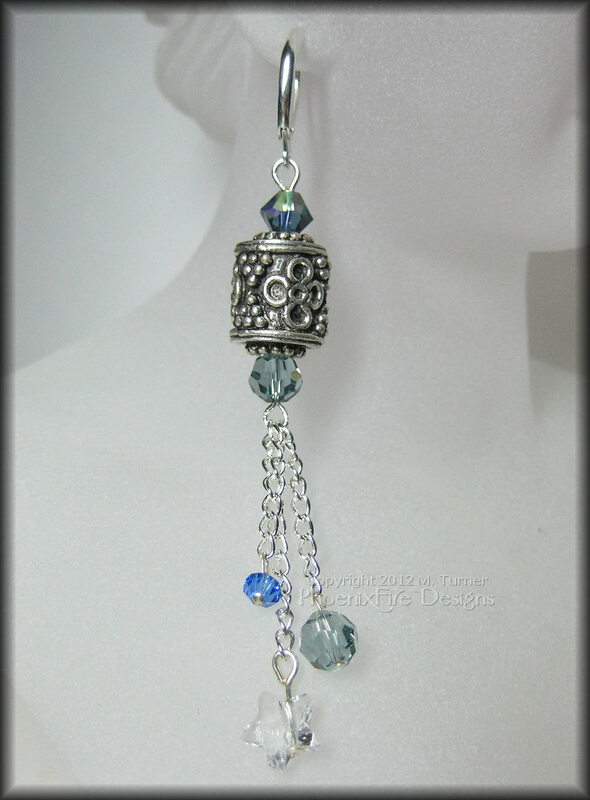 Made from glass pearls and accented with genuine Swarovski crystal, this metal hook bookmark will hold your place in your favorite book while you put the kettle on. The charm dangle is about 1.25″ and the total length of the bookmark itself is 5″ It will fit anything from thin paperback or a thick, hardcover book. (As you can see, it easily marks my place in the large, Harry Potter and the Deathly Hallows book with ease.) The bookmark is thin and will not warp or damage your books. Just a cute little piece for anyone who likes tea and reading! You will receive the exact piece shown. It’s a one-of-a-kind as I do not have any further teapot components on hand. I made this piece as a Mother’s Day gift. Her mom wears a lot of blue and brown and that’s a great color combo together so I ran with it. I used some Swarovski crystal accents, genuine Swarovski crystals in round and bicone and finished it with a Swarovski clasp. It’s pretty enough for a special occasion but can also be worn everyday to work or just out for the day. As always, if you have an idea for a unique, truly one-of-a-kind piece, just email me! I’m happy to discuss what you have in mind and make something special just for you.